This is the 8th, and final, Botanical Print in a set of 8 that I have been sharing each week! This one is a Poison Ivy plant. Yikes! You can find the 7th one in this series HERE. These date to the 1880’s. So nice to frame all together! 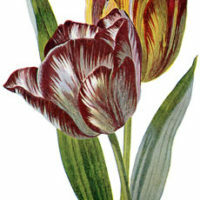 12+ Spring Tulips Images 8 Circa 1905 Garden Flower Illustrations – Updated 10 Pink Botanical Clip Art Vintage Flowers- Updated! Thank you! Saving this graphic pic as a reference. Thanks so much! I will have the whole set as soon as I can access the PDF. All of a sudden, for some unknown reason, all the PDF links on your site are taking me here: https://drive.google.com/start?authuser=0#home . I have tried in different browsers, but no luck. They must have differant POISON IVY – this is not what we have in IA and I an so allergic too. P.S. Lisa, the PDF link worked for me. The resolution was 800 x 1035 pixels; in Windows (after clicking on the image twice), it was 1077 x 1600 pixels. Deceptively pretty plant! 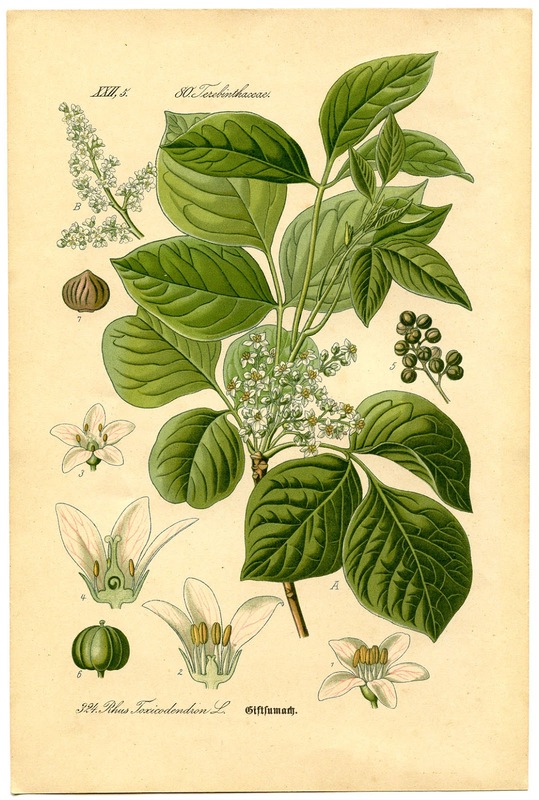 I haven’t seen blooms on what I call poison ivy….mine has pointy leaves, three in a group. Maybe I haven’t let it grow long enough to bloom…..? Anyhow, thank you for the PDF, Karen! Thanks everyone! The print is from Europe, so the plant may look different over there. Lisa, Pat C. is correct, you can just click & save the image right on the page, it will be the same size, but the resolution isn’t as high, so the quality is not quite as good as the PDF. Beautiful plant for all the rash it causes! Thanks, love your botanicals. Thanks so much for the help Pat. Yes, I really would like to have it in the higher resolution pdf for printing. It’s so strange because I’ve not had any trouble saving any of the others in the set, and now, for this last one, the link takes me to some page that tells me all about Google Drive. Apparently I’m not the only one having a problem with this as I noticed several comments on the pretty pear botanical posted the other day. Pat, yes, it is “ppi” aka “pixels per inch” that determines the resolution. You can have two images that each measure 500 px by 500 px, but if one contains 300 px per inch and the other only 72 px per inch, then the one containing 300 px per inch is the higher resolution image. Hope that makes sense and I will email you about the pdf file. Thanks for the offer!! I don’t see a link for a PDF for this image. All the others in this series came in a PDF format and I was hoping to frame the whole set. Hi Carla, we added it for you, thanks for letting us know so we could get that added 🙂 You can go ahead and grab it now! !